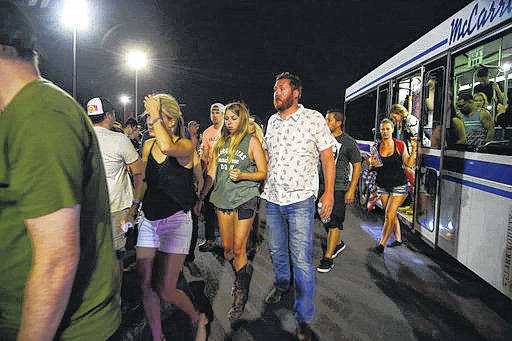 People arrive to Thomas & Mack Center via bus early Monday after hiding inside the Sands Corporation plane hangar after a mass shooting in which dozens were killed at the Route 91 Harvest country festival in Las Vegas. A Powell resident was in the crowd at a country music concert Sunday night in Las Vegas when a gunman in a nearby hotel opened fire on the crowd, killing 58 people and injuring hundreds more. Relva Cooper, a Lewis Center woman, said Monday that her adult grandson, Zachary Beebe was not injured in the shooting. She said Beebe is the manager for up-and-coming Ohio country musician Carter Winter and was attending the country music festival in Las Vegas for work. Cooper said she spoke to her grandson Monday morning and he told her someone was shot in front of him. She said her grandson carried the man out of the concert area so he wouldn’t be trampled in the chaos. Cooper said her grandson was staying in a home in Las Vegas on Monday because all of the airports were closed. The Associated Press reported Monday that the suspected gunman, Stephen Craig Paddock, a 64-year-old retiree from Mesquite, Nevada, took his own life before police stormed his room on the 32nd floor of the Mandalay Bay Hotel and Casino. According to the Associated Press, more than 22,000 people were attending the performance by country music star Jason Aldean on Sunday night at the Route 91 Harvest Festival when the gunman hammered out a window at the Mandalay Bay Hotel and Casino and began firing with a cache of weapons. At least 515 people were injured in the attack, along with the 58 confirmed dead, according to the AP. There also were no known links to any international terror organizations, officials said, despite a claim of responsibility by the Islamic State group, the AP reported Monday. The AP reports the Clark County sheriff’s department is leading the investigation, and U.S. Attorney General Jeff Sessions ordered support from the FBI and other federal agencies.